Christine Martinez studies Global Studies with minors in journalism and Spanish at San Jose State University in San Jose, California. 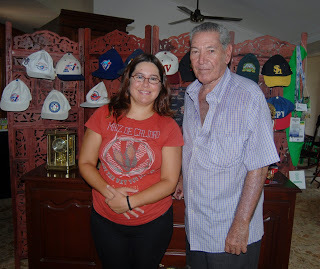 She is participating in InteRDom’s Fall 2011 Academic Semester, taking courses at a local university and carrying out a research project specially structured for her by InteRDom staff on thebusiness of baseball in the Dominican Republic. The articles that she produces will be published on this blog under the tag “InteRDom Experience Series.” To read more about Chris’ experience with InteRDom in the Dominican Republic, read the InteRDom Experience Series on the InteRDom webpage. To understand baseball in the Dominican Republic, it’s best to consult the best man for the job.Epifanio Guerrero has signed more players to Major League contracts than any scout, has produced World Series winning talent, and has won loads of awards for his accomplishments. He continues his work as an independent scout in the Dominican Republic today. Artifacts of both milestones are also in Guerrero’s Santo Domingo home. There’s a picture, yellowed with age and hanging on the wall, of Guerrero standing with seven of his kids in 1991. A white baseball cap embroidered with the old Blue Jays logo and a special inscription of the DSL team’s 38-0 record hangs on his bureau.